Bannok prodded gingerly at his bad shoulder. It wasn't bleeding - wasn't even that badly hurt, on the surface - but the whole thing was a blue-black mess of bruise. He was only grateful that the swelling was being kept under control by the tight bandage he'd wrapped around it. His ribs, though. One of those was cracked at least, maybe broken. He swung his arm forward, testing the range of motion, and grimaced when pretty much everything complained at him. "That's from the kraken?" Niettah asked quietly. Bannok blinked up at her in surprise - he hadn't heard her come in. He grinned. "You look like a proper pirate now," he told her, dodging the question. The simple dress she'd worn before had been little more than threads by the time they'd got back to the ship, nothing of it worth saving. She was dressed now in some of Sam's spares, Bannok being too tall and too broad for any of his to fit her. Not that Sam's were perfect - the brown trousers were a touch too tight, the blouse overly large and loose. The sleeves were practically hanging over her hands. "Here," Bannok said, digging through the collection of torn cloths they used as bandages. "If I had pink I'd give it you, but I hope that red will suffice?" "That joke was old before you told it," Niettah said, but she took the strip of cloth with a nod of thanks and wound it several times around her waist to keep the worst of the billowing under control. "Your shoulder?" Drat. He needed to work on his ability to change the subject. "It'll be fine," he assured her, rolling his arm in a circle to demonstrate. The spike of pain it brought was barely debilitating. Only temporary agony. "I'll heal." She frowned at him, moving forwards and stealing a bandage from the pile. "You'd heal faster with a potion," she said. "I don't suppose you'd take a detour to the healing springs?" Bannok snorted. "To faerieland? We're pirates. Like I said, I'll heal." He didn't stop her from untying his own sorry attempt at binding up his shoulder and redoing it, even though her bandages were far tighter and more restricting than his had been. She looked like she was going to say more, so he cut across her. He'd been a pirate for years; the freedom of it was worth the occasional ache and scrape. He didn't need any sympathy - or worse, pity - for what was his own choice. The look she gave him said that she knew exactly what he was doing, but she let it slide. "With the chest. He's still trying to fix the amplifiers, I think." She tied off the last knot and tugged the bandage straight, shooting him a stern glare when he tried to shift it somewhere less constricting. He held his hands up in defeat (or one hand, at least; she'd tied the other down so he could lift it to chest height but no further). "Best see how far he's got," he said, levering himself up and slipping his coat back on. "If we leave him too long he's likely to blow the whole ship in the name of experimenting." When they approached him though, the lutari had pushed the amplifier guns aside and was poring over the new map piece. The lutari grunted a distracted hello and turned the map through ninety degrees. Bannok nudged his shoulder. "Oi, genius. Care to share?" "Not got anything worth sharing," Sam huffed, holding out the map. He tapped a finger on a series of smudged marks along one edge. "Just these." "Looks like water damage, that's all. Or age." Bannok shrugged. "Same as the other pieces have." "I know, but the map was sealed, Bannok. It's in mint condition. Perfect, peachy, pristine, pure as the driven snow - "
"Get to the point, Sam." "Point is, there's no water damage." Sam pushed the map forward again. He was right; every line, every word was crisp and clear. Except for that one side. "And," Sam continued, reaching for the discarded barrel of the amplifier gun. "Look - the same marks." He ran his finger down the twisted wire of one side. Bannok squinted; there were vague shapes, yes, but the same shapes as on the map? "Maybe," he allowed. "Worth looking into - but later. We need to return the delfins." "Aw, really?" Sam's face fell. "But Finn and Delilah like it here!" "You named them? What am I saying. Of course you named them." The lutari grinned. "Yeah, because Delilah is like Del, so you get Del and Finn which sounds like -"
"I got that, thank you." 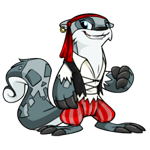 Bannok shook his head as he turned to go on deck and ready the Arkmite to make sail. "You've got to be the worst person at naming things. Ever." "Ok, so Del and Finn are a bit of a stretch, but Oliver and Josephine are hardly unreasonable." "Reasonable people don't name their instruments, Sam. Saxophones and trombones don't need names." "And which of us has played in a royal orchestra? Hm?" Bannok rolled his eyes in mock exasperation, but he couldn't deny that he was relieved. The friendly bickering was a thousand times preferable to the tension that had been between the two of them over the last couple of days. "Bye Delilah," Sam said mournfully, wiggling his fingers at the pair of petpets. "Bye Finn. Parting is such sweet sorrow, but you must be strong." The tuskaninny they belonged to shifted in his seat. "Look," he said gruffly. "If they're meanin' that much to you, I could be persuaded to put them for sale or summat." "You could?" Sam visibly perked up, turning to Bannok with wide, hopeful eyes. "Well, for a price." The tuskaninny nodded eagerly, clearly warming to his subject. "These are the delfins that beat the Teeth, you know? Quality merchandise, me. Don't be comin' cheap now, does it?" "Thank you," Bannok cut in hurriedly, "for your kind offer, but I think they'll be better of with you." "A'right then," the tuskaninny agreed, hands raised to show he wasn't going to press the issue. He adopted a sad expression that sat ill on his rough features. "Shame an' all, the fellas liking you so much. These things happen, but still. Right shame." "The delfins and I share a deep and spiritual bond," Sam said, nodding furiously along with the tuskaninny’s words. "It's an aquatic thing, you wouldn't understand." Bannok's response was a dry: "Lovely," as he grabbed Sam by the arm and forcibly steered him away. "Next time you form a bond, do it with something cheap, would you?" "Yeah yeah," Sam grumbled. He shook his arm out of his brother's loose hold and glanced around the crowded wharf. Impromptu market stalls had sprung up, the vast majority of them on fold-away tables or even wheelbarrows and carts. Sailors wove among the vendors and street hawkers with practiced ease, passing crates of fish up to a wagon, rolling barrels down centre aisle. It was a loud, chaotic mess, the sort of hub of life where fortunes could be won and lost on the roll of a dice and where the entire market could pack up and vanish the moment an authority figure was spotted. Not that the Defenders cared much about some backwater black market port, but still. It was the principle of the matter. Sam frowned as he spotted Niettah, waiting by the ship. She'd been backed up against the side of the hull by another pet - a kyrii, it looked like, taller than Bannok and with straggly braids in his mane. He elbowed Bannok and jerked his head towards the interloper. "Hey, should we do something?" Bannok looked over and cursed under his breath. "I knew bringing her here was a bad idea." "She wants to be a pirate, she's got to learn these things." Bannok shot him a dark glare. "She's not going to be a pirate," he denied. "She belongs in a palace with fancy people and fancy dancing, not in a place like this with us." Which was... An interesting response. Sam was certainly intrigued. He'd never heard Bannok be anything but dismissive of the noble lifestyle; this abrupt turnaround required investigating. But potentially not right then, when Niettah had taken yet another step backwards and the kyrii had responded by leaning one arm against the ship to block her escape. Although, maybe Bannok did have a point; even dressed in Sam's ill-fitting clothes, Niettah stood out. They didn't get faerie pets often in pirate haunts. Or pets as clean as Niettah was. Bannok had already started pushing his way through the crowd to rescue her, and Sam hurried to catch up. "Should've got her a sword," he was muttering under his breath. "Should've left her below deck, should've kept her where it was safe." "Isn't that her decision?" Sam pointed out. "I mean - whoa!" He was slammed roughly to one side and went sprawling on the floor. "Watch it," the lupe that had walked into him growled. Sam flattened his ears against his skull and curled one lip in a snarl of his own, but the lupe just snorted. "Pipsqueak," she sneered derisively. "Oh, goodness," a second voice said. Sam found himself being manhandled upright and held in place while he was brushed down. "Oh, you poor thing, I'm so sorry for that." "I'm sure it was my fault," Sam protested, trying to escape. The elephante's grip was like iron though, as well meaning as it was. "Mercy, look at your coat - oh, that's going to stain," she continued, her face a mask of horror. She turned towards her companion with a reproachful stare. "Kay, how could you?" The lupe scoffed, crossing her arms in a clear sign of disinterest. "Like he said, his fault. You done?" Sam tried to see past the elephante to catch sight of Bannok or Niettah. He hoped Bannok hadn't waited; if the other kyrii backed Niettah up any further she'd be in the water by now - and as they'd discovered at the Teeth, she wasn't the strongest of swimmers. "But you simply must allow us to apologise," the elephante babbled, reaching up to tug Sam's shirt straight. He ducked under her arms and backed away as quick as he could manage in the crowd. "No need," he called back as he retreated. "Apology accepted, please go away now, nice doing business with you." The elephante reached after him, more exclamations of dismay on her tongue, and he turned and bolted for the ship. Honestly. Some people were so weird. He reached the ship to find Niettah standing with her tail curled primly around her legs and Bannok doubled over with laughter. There was no sign of the second kyrii. "Okay?" he said unsurely. "Did I miss something? Where'd the other guy go?" Bannok started laughing again, so it was Niettah who pointed at the water with a rather smug grin. Sam leaned over and blinked in surprise when he saw the wet and bedraggled kyrii hanging from one of the mooring ropes. "You pushed him in?" he asked Bannok, nonplussed. "Not me," Bannok gasped out, pointing at Niettah. "You did?" Sam stared at Niettah. She was a slender scrap of a thing - the kyrii must've been three times her size, easy. "Full-on shoulder throw into the water," Bannok said. "Best thing I've seen all day. And you should've heard him squeal - music to my ears, I swear." "It's music," he breathed, fishing in his pocket for the map. "The marks, they're music - where did I - what." "Sam?" Niettah asked, watching him with a worried frown. "What's wrong?" He checked his other pocket with trembling fingers. Nothing. "The map," he croaked. Then, realisation hit him and he spun around, frantically scanning the crowd for the lupe and the elephante that had run into him earlier. Nothing. "They took it," he snarled. "They took the map!" "Who?" Bannok demanded, all traces of laughter gone. "I don't know! Two people. Girls. Two girls, this really mean looking lupe and an elephante - they ran into me, just now." Sam dug his fingers into his palm in frustration. It was the oldest trick in the book, the first basic trick that a thief learns. For crying out loud, it was a trick that Sam himself used often enough. If he hadn't been distracted by that stupid kyrii bothering Niettah, he never would have fallen for it. "You think they knew what they were after?" Niettah asked. Bannok nodded, face pinched with worry. "They must've done. A piece of parchment isn't your usual pickpocket fare. Someone tipped them off that we were had it; they must've been waiting for us to come back." "Who, though? You were the first people I told. No one knew I'd joined your crew, I made sure of that." Sam scoffed at her naivety. "Bannok's friend Harry," he rattled off, the suspicion coming easily to his mind. "Or the tuskaninny we got the delfins from. One of Baeyren's guards putting out a general description of the two of us. Some kind of tracking spell on the note we took from Ami's portrait. Anyone." Bannok held up a hand to stop him. "It doesn't matter who," he said. "Can we trace them?" "No," Sam admitted. The failure stung, both in losing the map and in not seeing it coming. Watching their back and distrusting everyone around them was his job. Whoever it was - and wasn't it convenient that Harry just happened to know a guy with delfins to lend them? - had lied and Sam hadn't caught it. And of all the map pieces to take, they took the one that was going to crack the code of those strange marks around the map. He tried to picture it in his mind, to see how much he could remember. It was a fool's hope; that level of detail was beyond him. "No, we can't trace them," he said slowly. "But I think I can guess where they've gone." Niettah was the first to catch on, her gaze sharpening. "You know where the treasure's hidden?" "That piece had a fairly recognisable coast line, yeah," Sam agreed. "I don't know where exactly, but it’s on an island and I know the one we're headed for." Bannok clapped a hand on Sam's shoulder with a predatory grin. "Ready the ship, Sam. We're going hunting."